So what were the top sports stories for 2016? We had the crowning of champions and the farewells to major legends. We had dreams fulfilled and other thoughts curtailed. More importantly, we had another year to remember in Hudson County sports, so let’s take a closer look at The Hudson Reporter’s Top 10 Sports Stories for 2016. 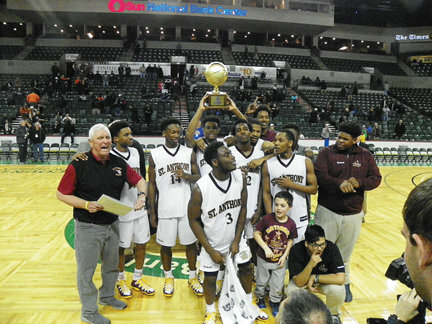 1-St. Anthony wins T of C again; perhaps the last? In March, perhaps the last page in a remarkable tale was written, when St. Anthony put a ribbon on yet another undefeated season by defeating Linden, 55-38, to capture the NJSIAA T of C title once again. It marked the eighth undefeated season in the storied history of the St. Anthony basketball program and yes, the 13th T of C title. No other school in New Jersey has more than five T of C trophies. So is this the most unlikely of the eight undefeated teams? “Oh, God, yeah,” Hurley said with a laugh. But there was a sense of finality to the Friars’ win. In September, it was announced that the school needed $10 million in order to remain open for next year. That’s a lofty number for one school to raise. We will have to see what transpires after the current season, but it sure doesn’t sound good. It was a year to remember for former St. Peter’s Prep football standout Minkah Fitzpatrick. In early February, Fitzpatrick was on the field when the Crimson Tide of Alabama held off Clemson to win the NCAA national football college championship. Fitzpatrick, a fine defensive back, made two key plays in the title game. Then in December, Fitzpatrick was named to the NCAA All-America First Team by Associated Press, the first local recipient of First Team All-American honors. It’s hard for any high school coach to stick around long enough to coach 600 games. With constant demands on time and the inability to have a functioning life outside of coaching, coaches that remain at jobs long enough to coach 600 games is remarkable. To win 600? Now, that’s a feat it in its own right. Tom Eagleson of North Bergen High School became one of the fortunate high school softball coaches in New Jersey to reach the 600-win milestone. The Penn Relays Carnival at Franklin Field in Philadelphia is clearly the storied, the most prestigious and the most historic track and field event in United States history. Other than competing in the Olympic Games, there is no bigger event, no more glorious of a venue than the Penn Relays. It’s the oldest and largest track meet in the country. It’s the Super Bowl, the World Series and the Stanley Cup finals all rolled into one magnificent five-day weekend. More than 15,000 participants from high schools, colleges and organized track clubs convene in Philadelphia each year for the Penn Relays Carnival. Over 100,000 track enthusiasts annually attend the Relays. However, this year, there were two local relay teams that went to the Penn Relays and collected the coveted plaque, namely a boys’ 4×400-meter relay team from McNair Academic and a girls’ 4×400-meter relay team from North Bergen. Imagine that. Hudson County had two Penn Relays champions in the same year. It’s almost too unfathomable to comprehend. First, on Thursday, the North Bergen girls’ team took to the track at Franklin Field. Head coach Elson Smajlaj thought he had a chance. As it turned out, the Bruins were champions. Two days later, it was McNair Academic’s turn. Head coach Matt Hogan thought he had a competitive team. And the two teams had a chance to be part of history at the Penn Relays Carnival. 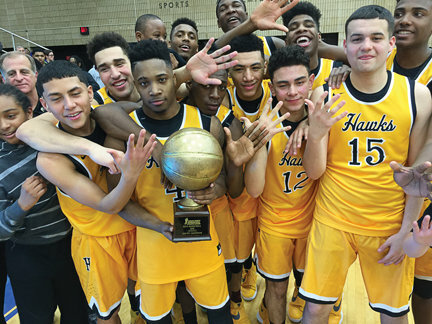 There was a time not so long ago that winning the Hudson County Tournament basketball title would be an absolute novelty for the Hawks of Hudson Catholic. After all, the Hawks went 37 years without winning a single county title. From the glory days of Jim Spanarkel and Mike O’Koren actually beating St. Anthony in 1975 in the Jersey City Armory to the present day Hawks of 2012, there was a championship drought at the school on McGinley Square. But now, it’s almost an afterthought. The Hawks have themselves a legitimate dynasty, after winning their fifth straight county crown in February, defeating rival St. Peter’s Prep, 74-55. Those days of winning the county championship as a novelty are long gone. In fact, according to the architect and mastermind behind the Hawks’ ascent to county royalty, Nick Mariniello, winning the county championship is now something that the Hawks plan on doing. “We look at it as something we’re supposed to do,” Mariniello said after the Hawks were never seriously threatened Saturday night. And it looks like the Hawks are not going to be relinquishing that title anytime soon. Luther Muhammad, the game’s high scorer with an easy, breezy 30 points, is only a sophomore. The same for Jahvon Quinerly, who scored 23 points in the title game just a few days after being held scoreless in a scary two-point semifinal win over Snyder. The track and field program at St. Dominic Academy is nothing short of historic. One walk through the school’s main lobby and there’s a museum-like feel with all the trophies and plaques that adorn the trophy case. There are tons of Hudson County trophies and plaques, 100 in all if you compile cross country in the fall, indoor track in the winter and outdoor track in the spring. There are even a handful of prestigious and adored plaques from the Penn Relays Carnival, perhaps the most respected track and field event in the country. It is widely believed that there’s nothing better than winning at the Penn Relays. St. Dominic has had teams to come home with track’s version of a storied religious artifact a few times. However, there was one piece of hardware that was missing among the hundreds of other awards – namely an NJSIAA state championship trophy. The Blue Devils achieved the final piece when they won the NJSIAA Non-Public B indoor track championship at the Bennett Center in Toms River in February. The Blue Devils had stud performers in senior Camille Bertholon and junior Malia Gray. When a team has athletes that can compete – and eventually win – in three events, it usually gives your team a chance to win championships. “We’re very fortunate to have the two studs,” SDA head coach John Nagel said. It had been since 1990 that the Snyder football team had qualified for the NJSIAA football playoffs. “I don’t think I was born yet,” said Tiger wide receiver Nasir Smith. No, Nasir, you weren’t, unless you’re the world’s oldest high school senior. It was 26 long years ago. Because since then, the Tigers have endured their fare share of losing. To be honest, a lot of losing. Before Marshall arrived last year and led the Tigers to the unthinkable respectability line, going .500 at 5-5, the Tigers’ best win total, over the previous 12 years, was two. There were four winless campaigns and the ungodly 39-game losing streak that Marshall inherited. The program was dropped in its entirety altogether twice for an assortment of reasons – both on and off the field. Another year, in 1996, a player named Tahid Ramsey died on the field. It was the last fatality suffered on the field in Hudson County. In 2013, the Tigers had a three-game stretch where they surrendered 82 points, 70 points and 64 points. From 2003 through 2014, the Tigers were a collective 12-91 and had six different head coaches. Needless to say, this program seemed to be beyond repair. But qualifying for the state playoffs? However, the Tigers have exceeded Marshall’s expectations in just two years, because the Tigers are indeed going to the state playoffs for the first time since 1990. Whitehead said that there’s a sense of pride in the school. In November, Hudson Catholic enjoyed a rare day, when the girls’ volleyball team and boys’ soccer team both captured their respective NJSIAA Non-Public B North state sectional championships – the first ever for both programs. First, in the afternoon, the girls’ volleyball team, already with its second straight Hudson County tournament in tow, defeated Union Catholic, losing the first set, then stormed back to win the last two games by scores of 25-17 and 25-18 in the third and decisive set. Six miles away, the attention switched to Kearny High School for the finals of the NJSIAA Non-Public B North boys’ soccer tournament, where Hudson Catholic was taking on Montclair Kimberley Academy. A single goal stood up, as the Hawks came away with the 1-0 victory. In August, two Hudson County schools were treated to visits from legendary sports celebrities. First, St. Anthony gets a visit from Hall of Famer Cal Ripken, Jr., with hope from Hope Depot, who came to the school with approximately $50,000 worth of upgrades to the school’s aesthetic view. Two weeks later, it was Heisman Trophy winner Eddie George, who told his the Soaring Eagles football team about physical training, health and well being. It was great to see these two legends make it to the local area. When the high school baseball season began, there were very few people who thought that the Marauders of St. Peter’s Prep would be able to repeat as the Ed “Faa” Ford Memorial Hudson County Baseball Tournament champions. That list included Prep head coach Pat Laguerre. But Laguerre went to work with his roster that was depleted by graduation. “We tinkered here and there to get the right combination,” Laguerre said. In May, the Marauders faced Union City, with the county tournament title on the line. Sure enough, the Marauders, who were the tourney’s top seed, managed to get just enough pitching and just enough hitting to come away with a 7-6 victory and take the Hudson County Tournament title for the second straight time, for the third time in four years and the fourth time in the last six campaigns. That sounds like a dynasty in these parts. There were other stories that were newsworthy, but did not make the Top 10 stories. There was the saga of Belinda “Boe” Pearman being hired as the new athletic director at St. Peter’s University, making wild changes to the athletic department, then in December, just 15 months after her hiring, Pearman was fired; Union City native Steven Gonzalez becoming a starter as a red-shirt freshman at Penn State and leading the Nittany Lions to the Rose Bowl; Union City girls’ cross country team winning their third straight Hudson County team title; the tragic deaths of former County Prep and Hudson Catholic softball coach Tim O’Donnell and his 5-year-old daughter Bridget in a car crash on the New Jersey Turnpike, there were the deaths of great Hudson County sports figures as Jackie Moore, Robert Van Zanten, Bill O’Donnell, Tim Camp and Tommy Brazicki; St. Peter’s Prep opens a new health and training facility; the Loyola School of New York has two cross country champions from Hudson County in Ben Schumann and Hannah Cavanaugh-Gouvea; former St. Peter’s Prep grid great Will Hill’s eventual banishment from the NFL due to drug use; the emergence of track and field standouts Tomatse Ogedegbe of Hudson Catholic and North Bergen’s Natalie Gomes; the Hudson Reporter crowned Camille Bertholon of St. Dominic and Royaal Jones of Hudson Catholic as the Female and Male Athletes of the Year; and 25 legends were named in a countdown of the 25 Greatest Sports Characters in the last 25 years of the Hudson Reporter. All in all, it was a great year in sports locally. Here’s to creating more memorable stories and feats in 2017.